Direct thermal printing uses a heated ribbon to produce durable, long-lasting images on a wide variety of materials. No ribbon is used in direct thermal printing, which creates the image directly on the printed material. Thermal transfer printing is a digital printing method in which material is applied to paper (or some other material) by melting a coating of ribbon so that it stays glued to the material on which the print is applied. 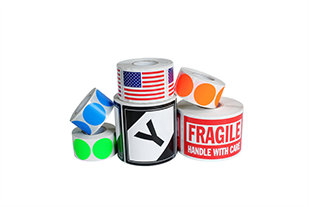 Have labels that create a positive impression and instant brand recognition. They’re great as promotional items or as part of your packaging. Available in a wide range of colors, designs, and sizes.